When a company recalls a product, it makes sense to assume that competitors can gain market share. However, a recent study published in the Harvard Business Review’s November 2106 issue suggests otherwise. The study refers to what is called perverse spillover: Here, one brand’s recall creates consumer concerns about the recalling brand as well about competitors of the same origin, but boosts the business of foreign competitors. According to the study, this is especially significant for highly dominant brands or models. For instance, if Toyota’s top-selling Corolla were to be recalled it would have a much stronger spillover on Japanese competitors than the recall of a less popular model of less popular brand like the Nissan Sentra. Recalling firms should avoid apologies: This would only increase awareness of the incident. Local competitors should avoid action: They should not try to take advantage of the situation as it would lead to increased visibility and reinforce the spillover effect. Foreign competitors should embrace action: They, however, should try to take advantage of the situation: For them it makes sense to run marketing campaigns as they are keen to profit from it. Track of social media conversations: Interestingly, the study specifically emphasizes the role of social media in such situations; Companies should set up dedicate teams to track the conversation around the product recall and adjust their marketing accordingly. This study is especially interesting in the context on Samsung’s recall of its Note7 due to risks of catching fire. In accordance to the research, the Note7 as well as Samsung are both dominant products/brands. 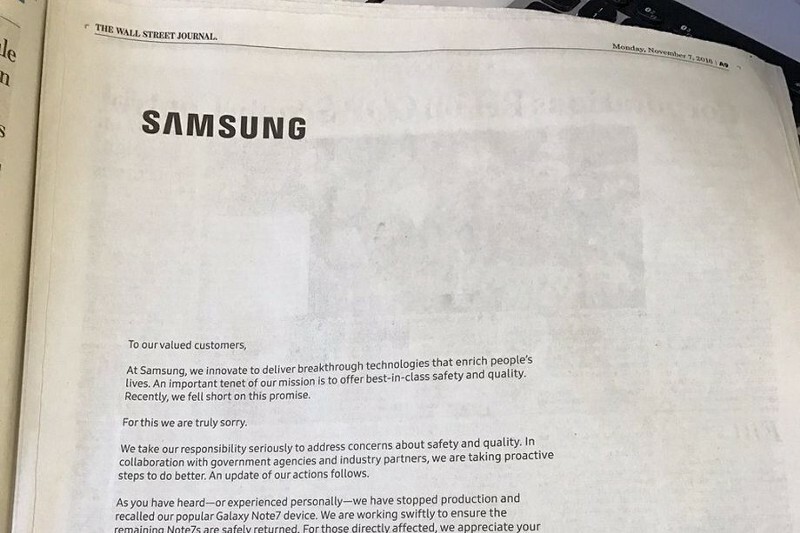 Also, Samsung published a full-page apology letter in the Wall Street Journal and amongst other things, clearly stating „…we are truly sorry“. According to the study, this is something they shouldn’t have done. And whereas it’s hard to tell whether market share has shifted amongst Samsungs competitor’s due to its recall a recent poll found that Samsung’s brand was not harmed by the recall. Its first recommendation is that recalling companies shouldn’t apologize at all. The reasoning behind it is absolutely comprehensible, but too shortsighted. First and foremost a company’s reactions will depend on the scale of the recall (a whole product line, only items from a certain batch…) and potential consequences (think of accidents caused by a burning Note7 vs. accidents caused by a non-functioning smartphone display). Further, companies have to consider when (at the beginning of the recall before any action was taken, after the recall, in between, multiple times…) how (which channels, mass or individual communication…) and what they want to communicate. In the context of timing tracking social media conversation, as suggested by the study, is important. The company has to communicate proportionally to the media and people; if the topic is a constant and a huge topic the company should address it. If the recall is not much of a topic in the news, the firm would do well to behave similarly in order to not create more attention than needed. In regards to the actions of competitors, I think there are more distinguishing factors than the nationality. If customers associate product quality with nationality, which happens, local companies indeed have to be very careful whether they should try to change the public opinion and especially if the costs of such marketing activities will outweigh the possible gains. If customers gauge product quality independent of nationality, national as well as foreign rivals stand good chances to take advantage of the recall, provided they clearly communicate their differences. Looking forward to your opinions on product recalls!